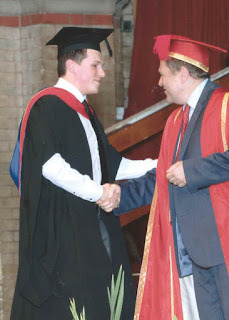 I was very proud to see my son graduate with a degree in Communication Technologies last week - I never thought we would have a Network Engineer in the family! He has worked so hard for this - he did so well to be accepted as a BT apprentice 3 years ago, when there were hundreds of applications and acted a STEM ambassador promoting Science, Technology, Engineering and Maths to younger students. And now he is going to study for another year to convert the degree into a BSc hons.